LCC is the only English high school in Montreal to offer the International Baccalaureate Diploma Programme (IBDP), where the focus is on an academically challenging, international education. The programme is taught over a two-year period (grades 11 and 12), and positions students for direct entrance to university anywhere in the world. Its mission and philosophy are entirely in line with LCC’s mission of fully developing students in mind, body, and heart, and preparing them for success and leadership in a sustainable global society. 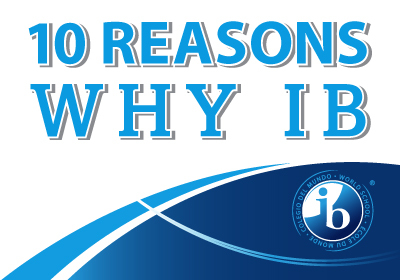 Approximately 50% of students in grades 11 and 12 opt for the IB Diploma Programme. In April 2013, LCC was recognized as an authorized International Baccalaureate (IB) World School, offering the Diploma Programme for students in grades 11 and 12. Although other schools in Quebec offer the IB Primary Years Programme (PYP) or the Middle Years Programme (MYP), we are currently the only English high school in Montreal offering the Diploma Programme (DP). The IB mission and philosophy are entirely in line with our school’s mission of fully developing students in mind, body, and heart, and preparing them for success and leadership in a sustainable global society. International Baccalaureate schools share a common philosophy—a commitment to a high quality, challenging, international education. Is an academically rigorous and balanced course of study with final examinations that prepare students for success at university and in life. Is a two-year programme that has gained recognition and respect from the world's leading universities. Enhances our existing Pre-University: Grade 12 Program and its reputation for outstanding university preparation. Allows for direct access to universities worldwide, including in Quebec, for students who gain requisite standing in the programme . Since 1970, over half a million students have graduated with an IB diploma worldwide. 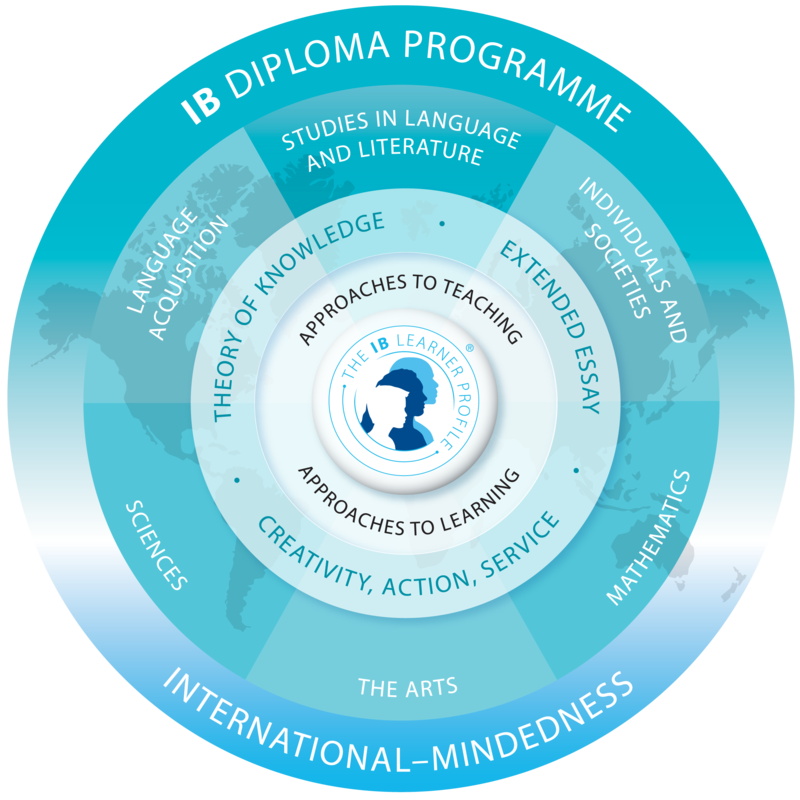 The IB curriculum comprises a ‘core’ and six subject groups. Students will select one course from each of the subject groups below. Three HL courses are required to obtain the Diploma. Students may select an additional elective from groups 1 - 4 instead of an option in group 6. Even though these courses run over the two-year period, the IB curriculum gels with the Quebec curriculum and all students will fulfill their high school leaving requirements after grade 11. School-supported self-taught language (SSST) courses and online language courses may be available. Consult with the Admissions Office. Disclaimer: Students may choose no more than one online course in their selections, and entry into the course is subject to a successful interview. Please note that there is an additional cost for online and SSST courses. Students follow a course in Theory of Knowledge, where they are encouraged to reflect on the nature of knowledge by critically examining different ways of knowing and different kinds of knowledge while drawing on their courses of study. IB Diploma students must complete a 4,000-word Extended Essay, requiring independent research through an in-depth study of a question related to one of the subjects they are studying. Creativity, Activity, Service (CAS) requires that students actively learn from the experience of performing real tasks beyond the classroom. To earn the diploma, students must complete a course of study in the six subject areas and the three elements of the core for two years. There are externally set and corrected exams at the end of the two-year course in most subject areas. This external assessment determines the score students receive. Students may take up to four IB courses without enrolling in the IBDP and may be able to earn advanced standing in those courses in university. Note that these courses must be followed over the two years. 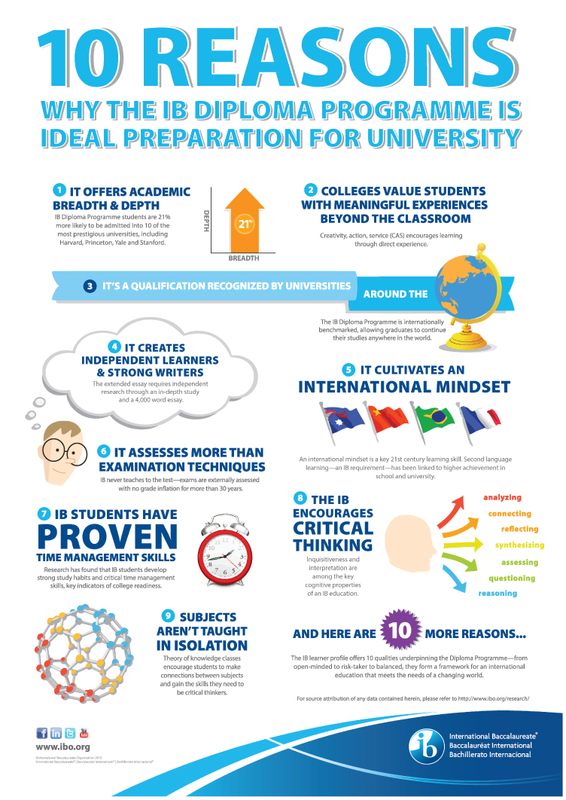 A number of independent studies conducted by universities in the US and Canada concluded that IB students are well prepared for the demands of university compared to non-IB students. The studies also indicated higher four- and six-year graduation rates for IB than non-IB students. A study conducted by the University of British Columbia concluded that the mean first year average of North American IB students is 4.35% higher than other North American secondary school students. In a survey that we conducted among our first cohort of IB students, 76% reported that the IB Diploma was instrumental in gaining admission to the university of their choice, 94% reported that the IB Programme was excellent preparation for university, and 81% reported that their grades either went up or stayed the same in first year. The 2014 National Association for College Admission Counseling survey revealed that the primary criterion for 79% of admission professionals is grades in college prep courses. IB or AP exams were number one for approximately 7% of those surveyed. Whether or not a student gets advanced credits depends on the university, the IB courses completed, exam courses and the program to which the student has applied. McGill, for example, may give credit for one full year, while UBC gives first year credit based on performance in higher level IB courses (and some standard level courses. In our survey, 77% said they received university credits for IB courses. Select universities report that if a school offers an enriched program, a student’s choice to take a less rigorous program can have a negative impact on the admission decision. Note that every university and program has its own admission requirements that will vary. UBC, for example, places a premium on IB students. Students entering the programme should have an average of at least 85%. Some HL courses, e.g., science and math, require a grade of at least 88%. Self-motivated, these students demonstrate the ability to think critically and show evidence of good research skills and proactive commitment to community service, activity and creativity. "Budgeting my time is one of the key skills that the IB DP helped me develop. Because you have to think quickly and write quickly for the IB exams, I learned how to work efficiently. Now I am able to get through tests with more confidence and less hesitation." Read more about the impact of the IB Diploma Programme on Harrison Mashaal's (Pre-U '16) post-secondary studies. "From a parent’s perspective, the challenging workload of the IB Programme prepared Ryan very well for the rigours of college." Read more about Dr. Ron Dimentberg's thoughts on the value of the IB Diploma Programme and how it served his son Ryan '15. "I thought that IB would provide me with a diploma that would be recognized by universities in many parts of the world." "I chose the IB Diploma Programme because I knew it was going to be challenging and because I was told that having the diploma would look great." Read more about why the IB Diploma Programme was a good choice for Arjun Chaudhuri '15. Will there be fees over and above the LCC tuition fees? What happens if the student withdraws from the programme after grade 11? Do teachers receive special training to teach at the IB level? If a student is a grade 11 LCC graduate who did not take the IB option, can s/he enrol in the Pre-U program? What is the minimum IB score for university admission? Do IBDP students take part in the co-curricular life of the school? There are additional costs for final examinations which take place in Year 2. These are only payable in the grade 12 year. Students taking online or SSST courses will have additional fees each year. Students who decide to withdraw following the first year of the IB programme will be very well prepared for CEGEP study and will receive their Quebec High School Leaving Certificate at the end of grade 11. However, they do have the option to stay for grade 12 and gain a Pre-U diploma. Each IB teacher/administrator is required to complete intensive training workshops sanctioned by the IBO and is also expected to attend subsequent workshops for further training once s/he has been teaching/administering the DP for at least two years. The curriculum for each course changes every seven years, and teachers in the affected subject areas must be retrained at this point. Yes, LCC will be offering the Pre-University: Grade 12 curriculum concurrently with the IB Diploma Programme. Non-IB LCC students and grade 11 graduates from other schools can enrol in the Pre-U: Grade 12 program. University acceptance standards and advanced credits vary. Therefore, it is important to consult the admission guidelines of the institution to be fully aware of its policy. Our university advisors can also provide guidance to students. IBDP students are school leaders, athletes and highly involved in all co-curricular activities. In fact, the CAS component requires students to be involved in co-curricular activities. Harrison Mashaal (Pre-U '16) wasn't fully convinced that the IB Diploma Programme was the right choice for him. Learn more about why he is happy that he stuck with it.